While a divorce proceeding can often be confusing and difficult, it does not always have to be. In many cases, spouses agree on each and every aspect of their divorce. This is called an uncontested divorce and is often settled outside of court, unlike a contested divorce. With an uncontested divorce, the husband and wife agree on a variety of family law matters. These often include child custody and child support. 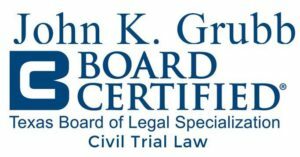 A Houston divorce lawyer, like attorney John K. Grubb, can work with clients to go over the agreements they have decided upon. This should include information regarding the care of their children as well as alimony, allocation of debt and the division of property. What Do I Need for an Uncontested Divorce? A year to date pay sub. What is the Benefit of an Uncontested Divorce in Houston TX? An uncontested divorce is often an easy and quick way of obtaining a dissolution of marriage. While you do not have to have a lawyer in this type of proceeding, a Houston divorce attorney helps ensure correct filings. An attorney can also help when the husband and wife are completing their Drafting of Orders and Final Judgment of Divorce. Your divorce is normally final the day you appear in Court or the day the Judge signs the Decree of Divorce, whichever is later. Need to Get the Texas Uncontested Divorce Process Started? An uncontested divorce is a clean and simple way of obtaining a divorce in Texas. To learn more about the benefits of finalizing an uncontested divorce, call our Houston divorce lawyer at (713) 877-8800. You can also fill out our online divorce contact form.